If you follow along on social media (Insta, Facebook, Twitter) then you’ve seen our exciting news! 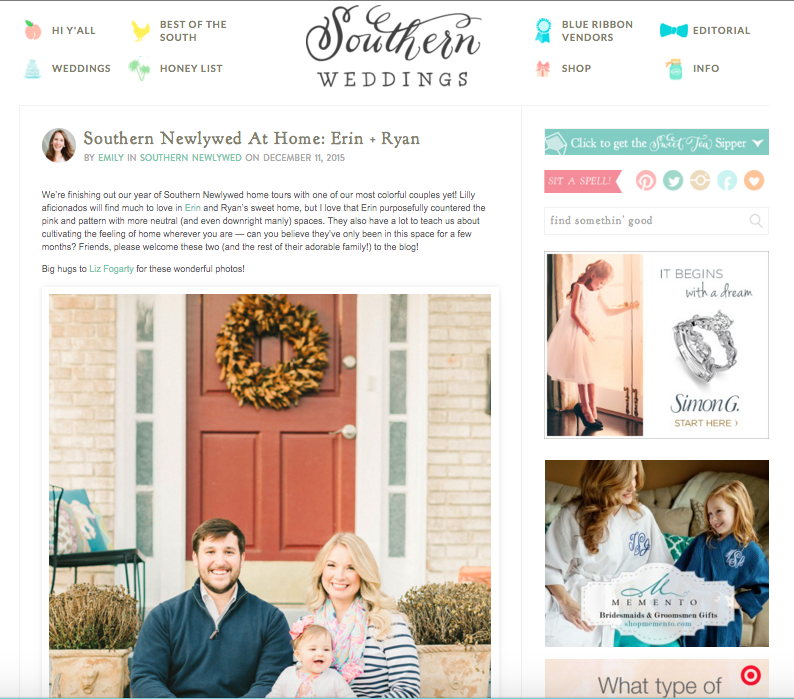 Southern Weddings featured us this week on their blog as part of their Southern Newlywed at Home series. Check it out here! I had so much fun and it was such a pleasure working with Emily at Southern Weddings, Liz Fogarty on the photos, and Izzy B Makeup! It’s no secret I’m a huge fan of Southern Weddings, it’s evident in the issues past and present still scattered around our home. When we got married in 2011, Pinterest wasn’t a thing, so I turned to Southern Weddings for inspiration. Ever since, I’ve been addicted to their blog and enjoy commenting on their posts. This is how Emily and I connected, via comments. I commented on a Southern Newlywed at Home post and included my blog link where I also have a home tour (granted, this is still of our Richmond home). Emily emailed me asking if I would be interested in being part of the series. Of course I jumped at the opportunity immediately! The rest, as they say, is history. Make sure to go check out the post, not only are the photos beautiful, but Ryan and I really had a lot of fun answering the interview questions too. If you are interested in being featured, go here to find out how to submit your home. I’m thinking about posting a sourcing guide for the items in our home that are in this feature. Let me know what items really peak your interest. So far I’ve seen requests for the plates in our dining room and the Lilly curtains.